When will Republican Rep. Henry Joy learn? The people of northern Maine don't want to live in a new state called Northern Massachusetts. 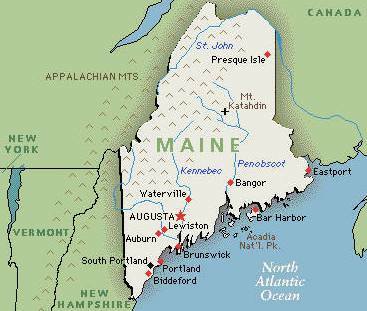 A Republican representative’s proposal to divide Maine into two states--a southern state that would retain the current name and a northern state that would be known as Northern Massachusetts--has been rejected by a bipartisan group of 10 of the state's legislative leaders. “The environmentalists have been working towards this for years,” said Joy in a March 9 press release announcing his proposal. “They plan to take 10 million acres in northern Maine and turn it over to the federal government…. They don’t want anybody up there,” he claims. Back then some argued that the new (upper) state should be named Acadia, a much more sensible suggestion than North Massachusetts, as the hardscrabble folks in northern Maine don’t want to be associated with the uber-liberal state of Massachusetts in any way, shape or form. Never mind that “Maine used to be just a part of Massachusetts until 1820, when it was split off to form a new state,” notes Trinklein. Armed robbery victims fight back with clothes iron—When is a gun no match for a clothes iron?